Plastic Windows SYNEGO – a high heat insulation and a perfect way to save. 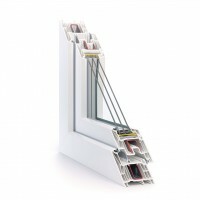 Installing Windows from profile REHAU SYNEGO, you will be much less to pay for energy. The 80 mm constructive depth profile allows you to set the glass up to a width of 51 mm. REHAU Synego this window 6 casement and 7, we chamber frame profile with a mounting depth of 80 mm,which provides high levels of insulation to save on heating your home. Thanks to the special formula PVC and the new improved method of production, the smoother surface profile. Therefore, dirt is not delayed, but Your window every day Shine like new. The special sealing system protects You from drafts and dampness, and will provide the optimal vestibule to enable You to open and close Windows without any extra efforts. Glass with energy-saving triple-glazing thickness up to 51 mm ensures additional protection from external influences. German fittings WINK HAUS allows you to set a variety of optional accessories that increase comfort and safety. Insulation with sealing fold Uf = 1.0 W \ m2K Soundproofing without steel reinforcement in Rw, P = 46Дб Features: Manufacturer "Vinnova" Profile system REHAU Synego Accessories: WINK HAUS Benefits of our Windows Increased insulation can significantly reduce heating costs and air-conditioning, enhancing comfort zone. Significantly reduces noise, turning Your home into an oasis of calm. The special sealing system protects You from drafts and dampness, and will provide the optimal vestibule to enable You to open and close Windows without any extra efforts. Thanks to the special formula PVC and the new improved method of manufacturing a surface profile smoother.